Today we begin the first of five assessments of Tatuaje’s Little Monsters Series. Over the next few weeks, we plan to deliver assessments of each of the blends that make up this most anticipated release by Tatuaje Cigars. The Little Monsters Series consists of a sampler pack consisting of smaller vitolas of the popular Tatuaje Monsters Series. The Monsters Series was created by Tatuaje founder Pete Johnson as a tribute to monster and horror movies. Since 2008, around Halloween, a limited edition cigar with a different monster movie theme has been released as a part of the Monsters Series. Each of the releases has been a new blend. In this assessment we explore the Tatuaje Lil’ Drac – a smaller version of 2009’s Tatuaje Drac. 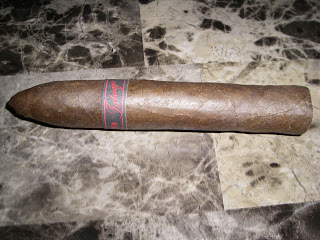 Overall, I found the Lil’ Drac to be a little different than most Tatuaje Cigars, but nonetheless an enjoyable smoke. There are two items of note from a packaging standpoint. First up, the Little Monsters have no special coffin dress boxes (these were artistic boxes meant to resemble monster coffins that were released as a part of the original Monsters Series). All Tatuaje Little Monsters come in an orange colored cedar sampler box. Secondly, some (not all) of the boxes contain trading cards (consisting of monsters). I was a little surprised Johnson opted for this marketing angle as he already knows the frenzy that surround the Monsters Series. It seems to me that the concept of including trading cards in some boxes (while a fun idea) just adds to frenzy. One important point of this assessment is that I have not smoked the original Tatuaje Drac, so this marks the first time I am sampling this blend. The Lil’ Drac uses the same blend as the original Tatuaje Drac. As with just about all Tatuaje Cigars these are made by the Garcia family of My Father Cigars. We are treating the Drac and Lil’ Drac as a blend here, so we are including the original Drac for completeness. Both vitolas are a torpedo shape and this was meant to represent a “fang” of the Count Dracula character. The wrapper of the Lil’ Drac is most intereting. While it uses a Habano Ecuadorian Maduro wrapper, this wrapper does not look like your standard maduro. It definitely is a lighter color – more of a medium brown wrapper. Keep in mind maduro is a process and not a coloring scheme. A lot of times, the process results in a dark wrapper – but not always. Therefore, it is very possible for a maduro wrapper to be in this medium brown shade. The wrapper of the Lil’ Drac is slightly bumpy, but it does have an oily complexion. The cigar itself has very few veins and very well-hidden wrapper seams. The torpedo tip is well-constructed on this cigar. The band is based on the standard “Tatuaje” scripted logo. The script font is red on a black background. To the left of the “Tatuaje” scripting is the text “little” in red font. To the right of the scripting” it says “monsters” in red font. It is worth noting that the placement of the band is below the torpedo tip. On the original Drac, the band was placed upside down by the foot of the cigar. The purpose of this was to make the Drac seem like the Dracula fang. For my smoke of the Tatuaje Lil’ Drac, I placed a straight cut into the torpedo tip. When I commenced with the pre-light draw, I detected some notes of grass and wood. I did not consider these dry draw notes to be very deep. The pre-light draw was somewhat disappointing, but we never factor it into our assessment rating or score (we talk about it more like an “appetizer”). It was now time to move on and fire up the Lil’ Drac and see what the smoking experience would bring to the table. The flavor profile for the Lil’ Drac was different than most Tatuaje and Garcia family cigars. The Lil’ Drac seemed more of an earthy profile. At times this reminded me more of a Dominican cigar than a Nicaraguan cigar. I didn’t find the Lil’ Drac to be an overly complex cigar in terms of flavor transitions, but I did find it to be a flavorful smoke. Right off the bat, there was a big difference with the Lil’ Drac compared to other Tatuaje Cigars. I did not detect the trademark Garcia family pepper blast at the start. Instead, the beginning of the smoke had some grass and wood notes in the forefront. There was also some unsweetened chocolate as a secondary note. I did detect some pepper, but it seemed to be more of a tertiary note. It also was more present on the after-draw and through the nostrils. As the first third of the smoke of the Lil’ Drac progressed, some earth notes joined into the flavor profile. These earth notes replaced the woody flavors early on and moved right into the forefront. The grass flavors became secondary joining the chocolate notes. The pepper spice pretty much dissipated and was replaced by some orange peel notes. Like the pepper, these orange peel notes were tertiary. The earth notes remained in control into the second half. It was in the second half where the pepper notes returned – replacing the orange peel notes. The pepper did begin to increase in the second half, but became no more than a secondary note. This was the flavor profile that held until the end. The close to the cigar was not overly spicy. The resulting nub was a little lukewarm in temperature, but remained firm. The Lil’ Drac’s short torpedo shape might look like a fang, but I still feel this cigar would have been much better as a classic parejo. Overall, it had a good burn, but not a great burn – something that often plagues torpedo and perfecto vitolas. The Lil’ Drac did require more touch-ups than I would have liked to keep the burn line straight. The burn rate and burn temperature were ideal, and the resulting ash remained tight throughout. To answer the question on whether a parejo would have made for a better burn – my gut tells me yes. As for the draw, usually I have bigger issues with this on a torpedo or perfecto than a burn. With the case of the Lil’ Drac, this was not a problem. In fact, I found the draw as good as I have found on a torpedo. The Tatuaje Lil’ Drac is what I term a classic “medium/medium” smoke in my book. This means it is medium strength and is not going to overwhelm you from a nicotine standpoint. It also means that it is medium-bodied – meaning it will have “just enough depth” for its flavor profile. The Lil’ Drac is a very well-balanced cigar between the strength and body as neither attribute overshadows the other. The blend for the original Drac is sometimes considered the least popular of the Tatuaje Monster Series blends. This is the first of the five Little Monsters’ blends that I have smoked and I found the Lil’ Drac to be a good cigar. I can’t compare this to the original Drac since I have not smoked that. I thought it was a nice change of pace for Tatuaje, and in a lot of ways it might appeal to someone who likes Dominican tobacco. While my gut also tells me the Wolfie and Baby Face cigars will be more along the lines of my profile, I still did enjoy the Lil’ Drac. I’d recommend this to a novice enthusiast looking for a quality “medium/medium” smoke. As for experienced enthusiasts, I would still encourage them to give this a try. For myself, I look forward to smoking this again. Source: This cigar was gifted to me by a friend. The Cigar Coop shipment of Little Monsters is still on backorder, but we expect arrival soon.